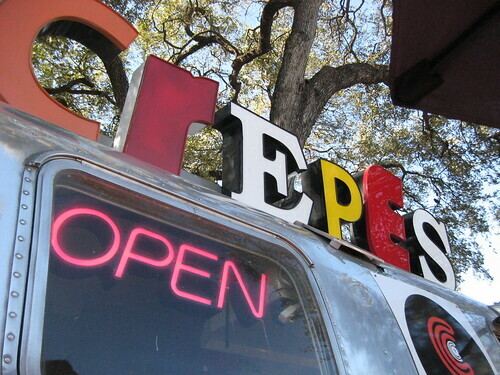 Food trucks are indeed not a new concept, but Austinites have propelled this industry to hew heights in recent years. Not only does the Texas state capital boast one of the world’s largest concentrations of mobile gastronomy selections, but the assortment of international and regionally inspired gourmet dishes are unbelievably tempting. In recent years, many of these food trailers have grown to boast such an extensive following that they ultimately were transitioned into brick-and-mortar operations. These four food truck standouts are on the precipice of that same notoriety. Parked on Jessie Street in midtown, a penny-pinching Francophile’s delight awaits at Flip Happy Crepes. These delicious, made from scratch crepes ooze with goodness, and the filling selections are seemingly limitless. Explore tempting crepe choices such as the chicken pesto or and the roasted pork topped with caramelized onions and melted goat cheese. Of course, sweet treats including Nutella and banana crepes and traditional fruit or chocolate choices also grace the menu. Unlike most French eateries, the portions here are generous, and the prices are more than reasonable. Dine at the tables fronting the truck, where dogs on leashes are welcome. Famed to serve up the best okonomiyaki stateside, Osaka Soul’s fare is truly inspired. People line up at the truck window before it even opens for service to grab a couple of these sweet pancake delights. Distinctively different from the Hiroshima crepe-style version of the dish, these okonomiyaki features several combined ingredients that are fire-grilled. What takes this food trailer over the top is literally the vast selection of toppings that diners can choose for their meal. Discover the wonders of this Japanese cuisine near Live Oak and South 1rst Streets. Look no further than the infamous 6th Street in Austin to satisfy any craving for kefthedas, souvlaki, gyros, and other authentic Greek cuisine. The Mati Greek Trailer has been doling out top-notch fare from the same location for years, and the lines still form until the food runs out. The owner, Jason Rodis, uses the recipes passed down in his family for generations and graciously shares the resulting goodies with locals every day. In the heart of downtown Austin, hungry tummies can be filled with most any smoked meat one can imagine at Boss Hogs Kitchen – where customers get to be the boss. Choose from a hearty selection of beef and chicken, or try one of the specialty pork or turkey cuts. Remarkably, even herbivores can satisfy their cravings here with a large selection of organically grown salad mixes. Locals seemingly cannot get enough of the bacon wasabi slaw or the baked beans loaded with apple wood smoked bacon to accompany their Texas-style smoked meats. Patrons range from hungry college students and busy professionals, to travelers heading out to enjoy the proximal state parks or water sports on nearby Lake LBJ. Be forewarned – these food trucks may be competing with hundreds of others locally, but these choices are so popular that running out of food is commonplace. Get there early and take some to go like the locals do, and discover the reasons that the food truck boom in Austin exhibits no end in sight. Lynn is a self described foodie and former Austin resident (who really misses the cuisine options the city offers!). While living in the Austin area, she also liked to visit the Highland Lakes and regularly writes about the things to do in and around the area.